This heathered thermal pullover hoodie is a great piece for dogs on the go. 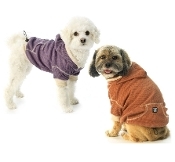 This is a lightweight pullover heathered thermal for dogs with an attached hood. This thermal hoodie features a contrast rib trim at the hem, sleeves and hood. The adjustable elastic cord at the bottom rib provides total pet comfort and the perfect fit. The kangaroo pocket on the back adds the perfect touch of style to this adorable thermal hoodie. This is truly a great versatile piece that is sure to keep your best friend warm and comfy all day!